What is that you ask? Let me tell you. It is an extremely cool program started by Lindsay over at The Lean Green Bean. Every month she communicates with about a 1000 people across North America and pairs individual food lovers and bloggers together. Now I’m an organization queen who loves making lists, but I have no clue how she does it. I’m not sure, but I think there is a strong possibility she’s a super hero disguised as a blogger. Here’s a quick rundown of how it works. You sign up through Lindsays site (click the link in my sidebar) then on the 5th of the month you get your penpal pairing via email. You trade information and get any details you might need (allergies, diet restrictions, address etc) to put together an awesome package ($15 maximum) and you have until the 15th of the month to mail it. Finally on the last day of the month (i.e. 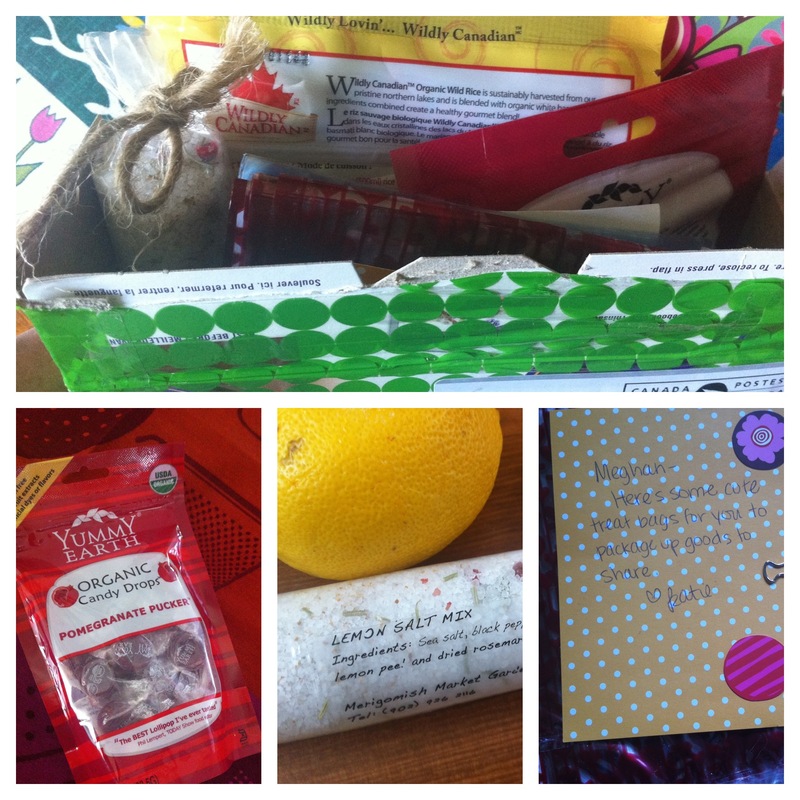 today), if you’re a blogger, you post about the goodies you received from your penpal. Not a blogger? No worries. It’s open to sane normal people too. You just get to skip the blogging part. The best part is you meet two new people – the person you mail to and the person who mails to you. Half of the fun is searching for the perfect items. You want it to make sense for your new penpal. For example a can of sardines is probably not appropriate for a vegan (is it for anyone? ), and cookies probably wouldn’t be the most sensitive choice for someone who says they are trying to lose weight. But any fun “foodie type” things are great. I got to shop and pack for Helen who lives right here in BC. You can read all about Helen on her blog What Happened Next. So before I tell you about the super package that I received from my new penpal let me tell you a little bit about her. Her name is Katie. Katie has a blog with one of the sweetest names I know polka dot soup. It’s obvious after reading only a couple of posts that Katie seems like a really neat lady who loves her family and her life. Please do go over and check out her blog. What excited me first about Katie is that she is from Nova Scotia. Yup, a bluenoser got hooked up with a bluenoser! Aside from the fact that she is from the province of my birth, I also couldn’t help thinking how cool it was that a package would be flying from one coast of Canada to the other. The Atlantic to the Pacific. Who says food can’t bring people together? Now in the interest of full disclosure I have to say that there is one downside to the program. Waiting. Waiting for your penpal package to arrive is a bit like waiting for Christmas as a kid. It takes forever! So when you arrive home and find a package on your doorstep it is exciting! When it is wrapped in green polka dotted tape like mine was (note the name of her blog people… not a coincidence…) it’s even better! This month I tried to exhibit great restraint by not ripping into it right away (it was tough) and waited until I had time to really sit down and savour it. Wow. It was like Katie had known me forever. She chose the most perfect items. Organic, local, and thoughtful. Look at all the goodness she packed into the box! It was filled with items I love, will use and wouldn’t always buy for myself. Fabulous right? So you see how much fun it is? 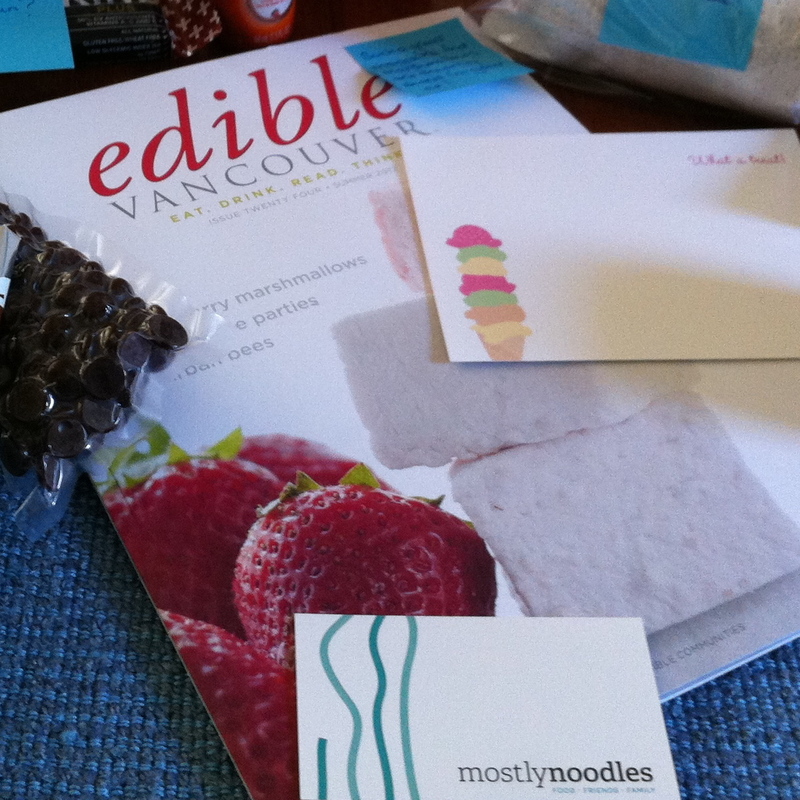 Actually, even if you don’t want to become a Foodie Penpal I encourage you to take a moment and send someone an unexpected treat. Some music, some food or maybe even just a postcard. I’m yet to meet anyone who doesn’t like to come home and find (friendly) mail. And once again, thanks to Katie, Helen and Lindsay for making the month of June a much cheerier month. This entry was posted in Food, Foodie Pen Pal, Friends and tagged candy, mail, rice, salt by mostlynoodles. Bookmark the permalink. FPP’s are so much fun! You should try contacting theleangreenbean – she may have other people in your neck of the world interested and could hook you up!